Is automatic “Reload from disk” confirmation in Text Editor possible? I use an external editor for my scripting. 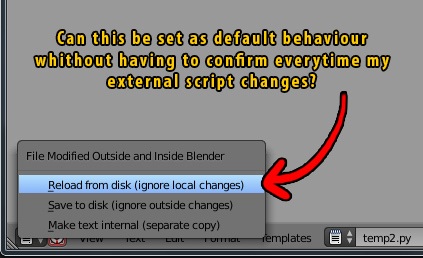 When I return to Blender I want the script in the text editor to reload my changes. Blender does indeed detect the changes (red button) which is great but it quickly becomes a nightmare having to confirm my changes over and over. So, is it's possible to make the "reload from disk" confirmation automatic, via preference, console command, or scripting? @batFINGER I tried to wrap it into an addon but I'm new to this and cant get it to work properly. Edit: removed code as it should be posted as a new question instead. A modal timer operator. See text editor > templates > python > Operator Modal Timer . The issue here is that while a modal timer is running, you may be turning off auto-save. I dunno about automatic, but you could make a keyboard shortcut to do it for you which is a little more slick than accessing it via menu with the mouse. Not the answer you're looking for? Browse other questions tagged scripting text-editor or ask your own question. Is it possible to run a script from an external editor without reloading the file? Is it possible to add images in the Text Editor?